The next day, I go to school again. One of the students has an important question. He wants to know how to improve his listening skills. He wants to know what the best approach is. Our teacher says, “Thank you for your question. Good listening skills are very important for communication. If you don’t understand what people are saying, it will be difficult for you to speak with them. There are a lot of materials on the Internet for students of English. Some students can have a problem with finding the right listening materials for them. Let’s have a look at what you should listen to. There are two types of materials which you can listen to. You can listen to some audio or you can watch a film. These are quite different materials and different rules apply to them. When you listen to some audio, you should know 95% of the words or more. If the audio has a lot of new words, read the text first if possible and make sure you know all the words. When you practise listening, you practise getting information from a spoken language. You don’t try to learn new words. Of course, sometimes you can learn new words, but it is not the main goal. When you listen, concentrate on getting information from spoken English. It is important to use materials at your level of English. For example, you can use books in simplified English which contain an audio recording. I really recommend these books to you. They are fantastic because you can choose a book at your level of English. When you have such a book, read the book first and then listen to the recording at home or when you travel. You can read two great books at www.robinsoncrusoeinlevels.com or www.thelittleprinceinlevels.com. Your can also visit www.newsinlevels.com if you like listening to the news. All these materials are in three levels of English. The second type of materials for listening practice are films and videos on www.youtube.com. These are also great. 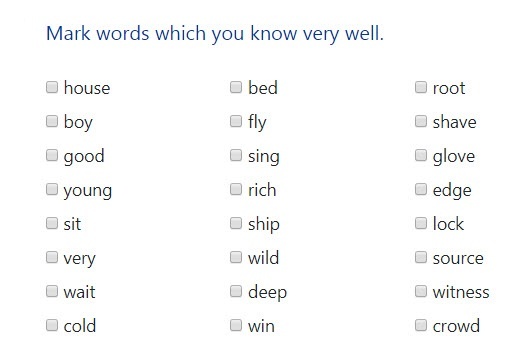 You can start using them when you know 2000 words in English or more. This is what you should do with a film. Watch it for the first time with subtitles so that you know what the film is about. Then watch the film without subtitles. If you like the film very much, you can watch it more than once. When you watch one film many times, with every view, you will understand more. It is also good to watch videos on the Internet about interesting subjects. For example, if you like nature, you can watch documentaries about nature. You can also watch reality shows. Reality shows are much easier to understand than films or documentaries because the structure of the show is usually the same. It is necessary to have at least 30 minutes a day of listening. The more you listen, the faster you will understand more words. When listening, you should always look at what you already understand, even if it is just 10% at the beginning. It is very easy to demotivate yourself by realizing all of the parts that you don’t understand yet. Look at what you already know. Be happy for every new sentence you have understood. The listening topic is very interesting for me. Now, I know what to do to improve my listening. When you want to be good at listening, listen for 30 minutes every day.